What would be other better way to share the good news of the birth of baby girl than this "Chocolates for girl"? 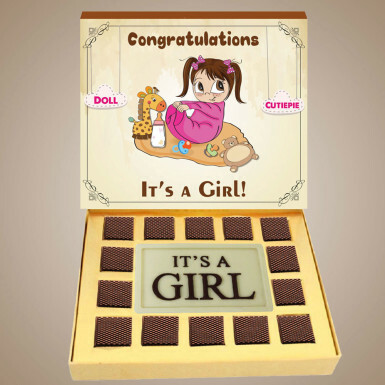 This box consists of dark chocolate truffles and a milk chocolate bar, proclaiming "It's a Girl" and satisfying the cravings with something delicious. It's a really perfect idea to celebrate the birth of a girl in a sweet manner. So, what are you waiting for? Add this product to your cart and buy it online from Winni.